Students participating in LAUNCH Learning Community programs (selected for ACREW, Century Scholars, GTF Scholars, FOCUS, or Ignite) ease their transition into University life with the support of peers, who seek sustained scholarship eligibility, and develop into empowered individuals who are on course toward their goals. Review each of the affiliated scholarship programs below for additional eligibility requirements and program components. Note: University Honors and Terry Scholars live in other locations on-campus. Regents’ Scholars that are receiving an Academic Achievement Scholarship from Texas A&M are required to participate in the ACREW Living Learning Community. ACREW Living Learning Community allows students to ease into the transition of college by having the support of their peers for their Freshman year. Receive a Texas A&M University merit scholarship. The Century Scholars Living Learning Program is an opportunity for freshmen Century Scholars looking to be a part of a tight-knit community during their first year at Texas A&M. The programmatic goals of the Century Scholars Program are to develop scholars academically and holistically. The Century Scholars Living Learning Program aims to strengthen the connections that Century Scholars have with each other and with the campus community. Students will be placed in small groups with whom they will take the freshman seminar course. The small group will have an upperclassman mentor who is there to help build the freshmen learning community and to act as a resource for Century Scholars freshmen in their first year at Texas A&M. The Century Scholars Living Learning Program is optional for incoming Century Scholars and has limited availability. Students must be first-year students in the Century Scholars Program. 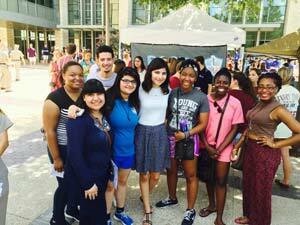 Fall Semester – Students will participate in the Century Scholars Kick Off and Orientation during Howdy Week. Students will be enrolled in a freshman seminar course to help them transition successfully to Texas A&M University, while developing them personally, professionally, and academically. Required Classes – UGST 181- Students will engage in a learning and social environment to help them achieve academic and personal success, discover ways to be involved on campus, and explore community engagement through this course. Monthly Activities – Students will participate in monthly large community meetings where they will engage with topics from financial literacy to building their personal Aggie Network. Students will meet once a month with their mentor and small community to create a support network to succeed their first year at Texas A&M. Spring Semester – Students will have the chance to apply in the fall semester for a study abroad experience over Spring Break to France. Student Organization – Students will have access to social, developmental, and community service events through the Century Scholars Organization (CSO). FOCUS students will deepen their sense of community by discovering commonalities and creating relationships that enhance the first-year experience. LLP programs include cooking family-style meals together, exploring local communities, friendly competitions, and pizza and professors discussions. Students in this LLP live among other Regents’ Scholars who are in similar majors making academic connections and support more likely. Living across the street from the LAUNCH: Learning Communities – FOCUS office makes seeking assistance in navigating the first year of college easier as well. Majors in the College of Agriculture and Life Sciences, College of Veterinary Medicine, the Department of Biology in the College of Science, and the Texas A&M Health Science Center School of Public Health. *Other first-generation students may choose to participate in FOCUS when spaces are available. Howdy Week Events – FOCUS students meet staff and mentors at the New Student Conference Briefing and attend a FOCUS Welcome Workshop and other sponsored activities during Howdy Week so there are familiar faces when classes begin. Weekly Events – You will participate in all-FOCUS events such as an Etiquette Dinner or Halloween on Ice, meet with your CARE team (small group) for social and learning activities, and take part in community service opportunities. Professional Development – Some FOCUS students apply to participate in special blocks for pre-professional school tracks like Pre-Med Scholars and others take advantage of registration in smaller (~25 students) reserved core curriculum sections. Professional Staff and Study Abroad – FOCUS students have a professional staff to consult when needed. FOCUS students receive access to program-sponsored supplemental instruction, academic coaching, and tutoring. Selected FOCUS students may travel to London or Paris on the Spring Break Field Trip. Ignite works to provide support, community, and resources to help first-generation students thrive at Texas A&M University. Our goal is to make that transition to college life as smooth as possible! As a member of Ignite you will: have the opportunity to learn from peer mentors who are also the first in their families to attend college, attend a weekly class that is geared toward learning and applying skills to help you succeed, have the opportunity to participate in events that help develop personally and professionally, and so much more! This learning community strives to make resources more accessible and your freshmen year more successful! Professional Staff: A program coordinator works full-time to ensure that Ignite students have the resources they need in order to ignite the future. The program coordinator and mentors serve as a great resource to Ignite students. The best part of having a mentor to help you during your first year is; if they don’t know the answer, they can help you find someone who does! The difference starts with you! It is time to Ignite your college career. Apply to Ignite today! To become a Posse Scholar is not only to receive a highly competitive national award, but to become part of an acclaimed network of highly accomplished college graduates through a program lauded by the likes of General Colin Powell, Sheryl Sandberg (the CEO of Facebook), and the MacArthur “Genius” Foundation. The Posse Scholars program provides outstanding students chosen by the Posse Foundation for exceptional leadership skills with intensive faculty mentoring and small group interactions. Posse Scholars benefit from tailored career and academic advising and opportunities for individual and community development. Upon graduation, Posse Scholars join the tightly-knit national network of Posse graduates to shape and influence industry, government, medicine, the military, and other areas. How lucky am I to be a Century Scholar? My freshman year at A&M was such a great experience thanks to the opportunities that the Century Scholars Program offers. The fall semester course, taken by all Century Scholars, was a stress-reliever and a class I thoroughly enjoyed! Compared to classes with 200-300 students, this class creates an intimate setting which helps in making friends! You know you’re around people who are in the same boat as you. My roommate and I both had the same goals in college; it was nice to be with other students who relate to you and your previous experiences.